When just a side of roasted cauliflower simply won’t do, reach for this roasted cauliflower salad. 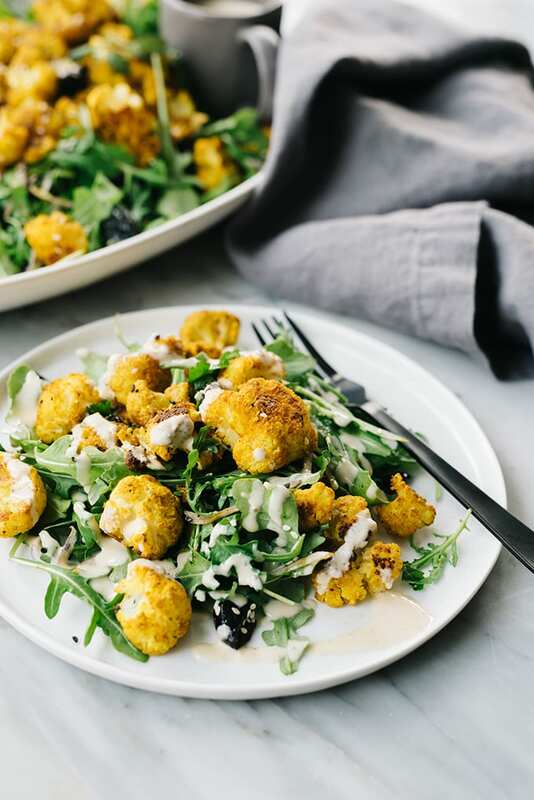 Sweet and nutty turmeric roasted cauliflower pairs so perfectly with briny, marinated olives and a tangy tahini dressing. This salad is packed with Vitamin C, and is so vibrant and nutritious. Clean, plant based eating at it’s most delicious! I get pretty regular cravings for roasted cauliflower. Weird? Maybe. Delicious? Duh. It was during such an occasion that this roasted cauliflower salad was born. I had been planning on making a batch of roasted cauliflower with olives, raisins and pine nuts and consuming the entire pan for lunch all by myself because I’m a greedy, selfish lady. But I looked and I looked and I couldn’t find any pine nuts in my pantry. Nary a nut to be found. A dilemma, followed by a bit of a tantrum (yes, sometime I’m the big baby ’round here). But instead of completely losing my cool, I pulled out my trusty Flavor Bible, found a shot of inspiration, and headed into the kitchen. And thirty minutes later I was enjoying this hearty and nutritious roasted cauliflower salad with spiced turmeric, briny olives, and peppery arugula, finished with a drizzle of yogurt tahini dressing. Ask me how glad I am that I didn’t have pine nuts on hand. I’ll tell ya – SUPER GLAD. Take that poor planning. Pretty sure I won this round. This recipe is clean, “healthy” eating at’s finest. It’s super nutrient with healing turmeric and vitamin packed veggies, but hearty enough to stand on its own for a plant based lunch or dinner that will leave you wanting for nothing. Wanna make it? Okay, let’s go! 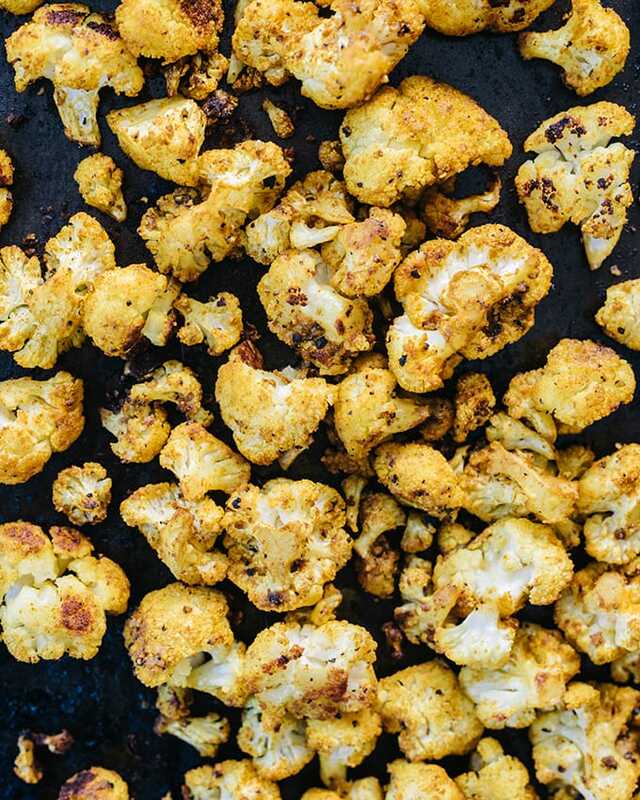 This flavor party starts with turmeric roasted cauliflower. YUM. 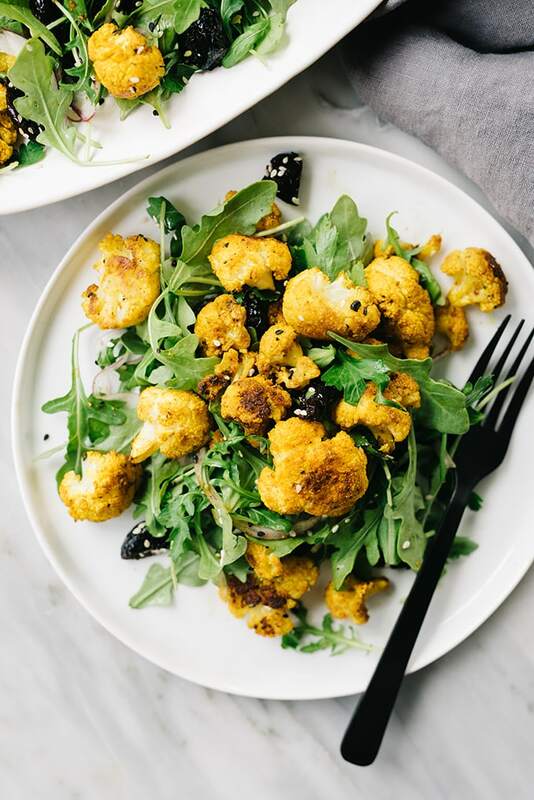 The combination of turmeric and cumin gives the roasted cauliflower a vibrant, golden hue and tons of flavor. The spices tame the natural sweetness of the cauliflower, once it’s been roasted so it turns out just sweet enough for a savory salad recipe. Start it off by chopping a head of cauliflower into bite-sized florets. If cutting cauliflower a bit of a….chore….for you, I hear ya. It can get really messy, really quickly. This video tutorial from Martha Stewart is my go-to method for cutting up a head of this nutritious winter veggie quickly, and easily, without drowning in crumbly cauliflower bits. Cut the florets on the smaller side – they’ll roast faster, and you’ll have enough room on your fork to pack in the rest of the bold flavors of this salad. 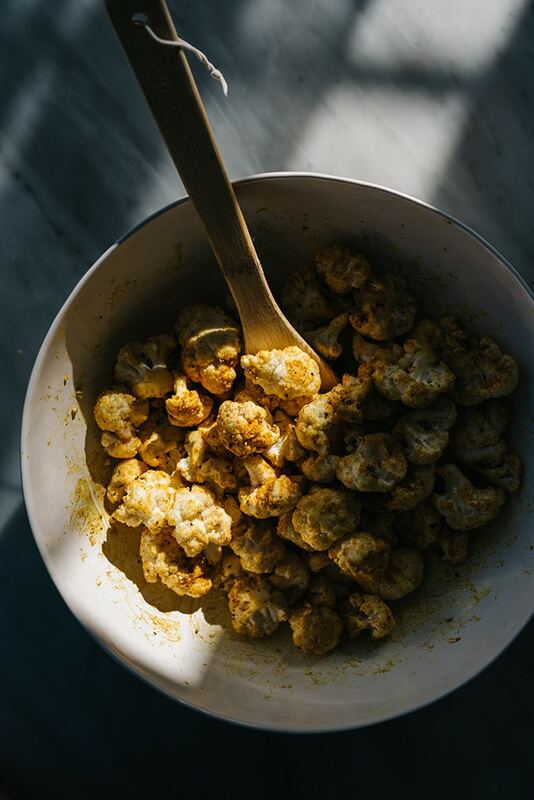 Toss the florets with a few tablespoons of avocado oil, turmeric, cumin, salt, and a pepper. Go light on the salt – the marinated olives add a big kick of brine to the finished salad, and as much as I love salt (hello, Our Salty Kitchen), it’s possible to go too far. Spread the florets onto a baking sheet, then pop ’em into the oven to get their roast on. Give the cauliflower a good stir about halfway through roasting so that they caramelize on all sides. See those caramelized bits up there? SO MUCH FLAVOR. Honestly, you can just stop here, but let’s make it a meal, shall we? While the cauliflower is roasting, make the salad base and the dressing. 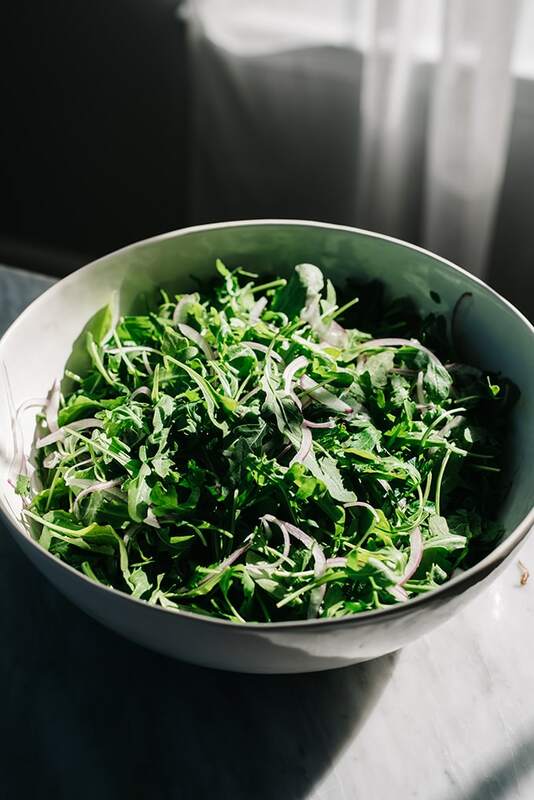 The base is just arugula (or another mild cool weather green like spinach or chard) with some parsley, thinly sliced red onion, sesame seeds, and a handful of olives. You can chop the olives or leave them whole, totally your choice. I prefer them chopped so that I get a salty kick in every bite. If you find that red onions are too strong for your taste, use shallots or leave them out. I like the sharp bite, but I’m not you – so you be you. Add chick peas or a cup of cooked quinoa for a little more heft and a protein kick. For the dressing, I modified my favorite lemon tahini dressing with yogurt to make it a bit more mild. There’s already a ton of flavor in this salad, and the dressing should complement, not compete. You can make this vegan by using vegan yogurt or simply stick to the original lemon tahini dressing. Thin out the dressing a bit and use sparingly to add just enough nutty flavor. 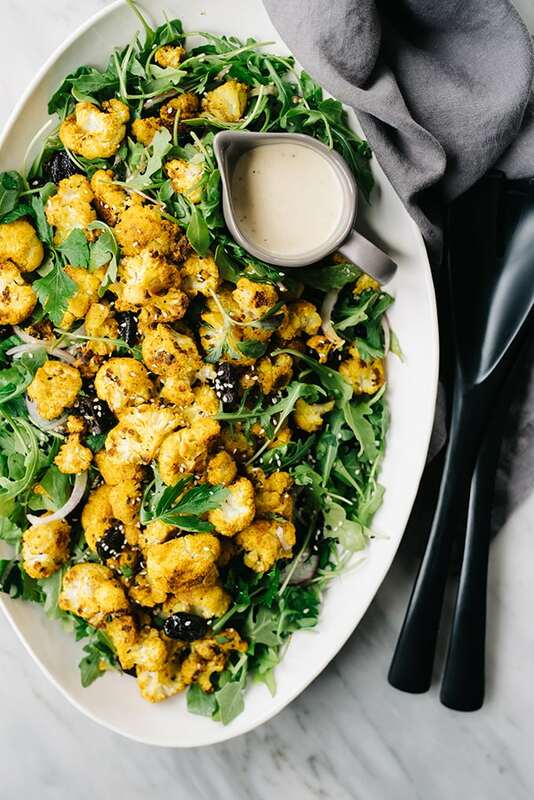 Once the the cauliflower is finished roasting, toss it onto your salad greens and drizzle with tahini dressing. Or don’t, and pack it up for lunch with dressing on the side. Whatever you do, share some with a friend so you’re less greedy and selfish than me. I kid…I shared a little with Cameron. PIN IT NOW, MAKE IT LATER! 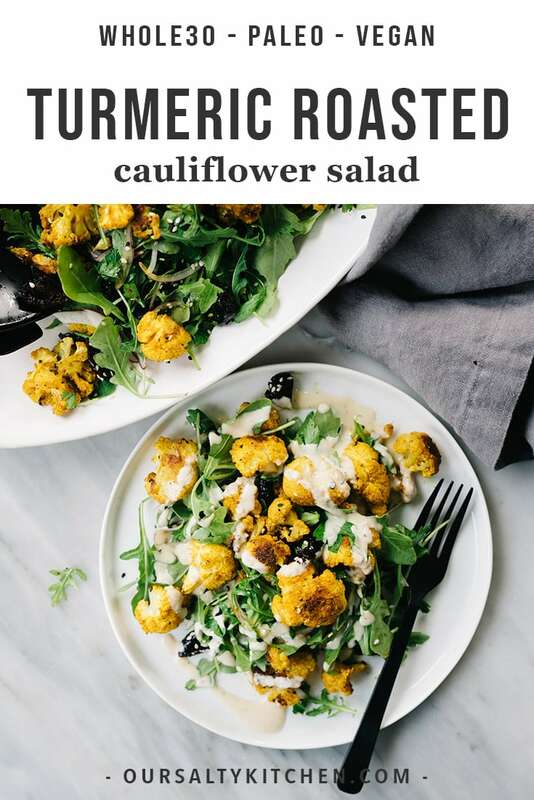 CLICK HERE TO SAVE THIS RECIPE FOR ROASTED CAULIFLOWER SALAD TO YOUR VEGETARIAN RECIPES BOARD ON PINTEREST! 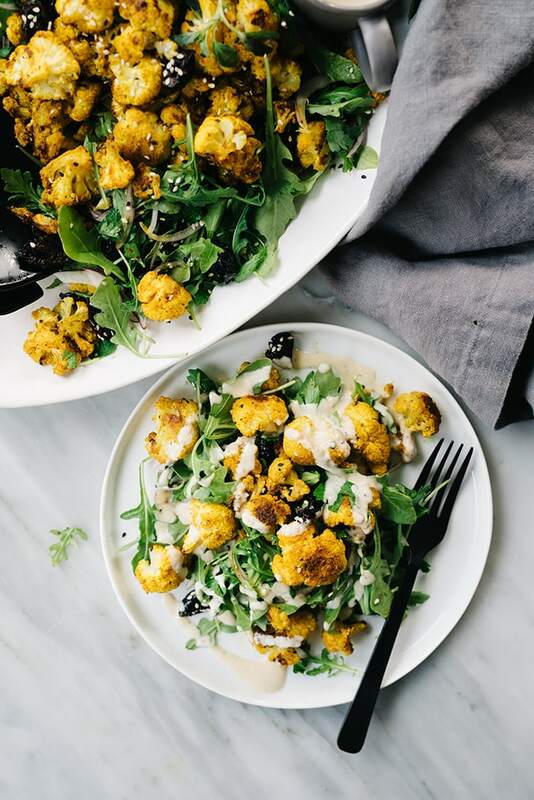 You'll love this roasted cauliflower salad seasoned with turmeric and slathered with tahini dressing. It's clean, plant based eating at it's most delicious, and ready in just 30 minutes! Cut the head of cauliflower into small, bite sized florets. Place the florets in a large bowl and add the oil, cumin, turmeric, salt and pepper, then toss to coat. Spread the cauliflower onto a baking sheet and roast, stirring once halfway through, until tender and browned in spots, 20 minutes. While the cauliflower is roasting, make the salad base. In a large bowl, combine the arugula, parsley, red onion, sesame seeds, and black olives. Toss to combine, then spread the salad onto a platter. Make the dressing. In a small bowl, whisk the yogurt, olive oil, tahini, lemon juice and pepper in a small bowl. Thin with water to achieve desired consistency. Taste for seasoning and add additional pepper if needed (skip the salt, as the olives add a briny kick). 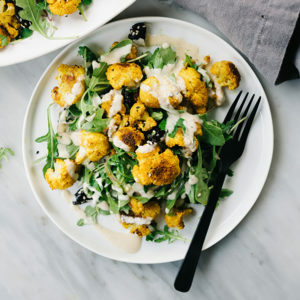 Top the salad with the roasted cauliflower, then drizzle with the yogurt tahini dressing. Serve warm or at room temperature. The roasted cauliflower keeps well on its own in the fridge in a sealed container. Reheat by sauteing in a dry pan over high heat or in the microwave for 1 minute. Alternatively, serve it cold as a packed lunch with the salad base. Disclaimer: This post contains affiliate links, which means we receive a small commission (at no extra cost to you!) if you make a purchase using these links. Rest assured, we only endorse products we own and truly love! I made this for dinner tonight and it was AMAZING! Love the cauliflower with these spices! I can never get enough turmeric 🙂 Delicious!